Harley-Davidson still lives in the neighborhood in which it was born. Right across the street, in fact. Published Jan. 22, 2019 at 9:02 a.m. 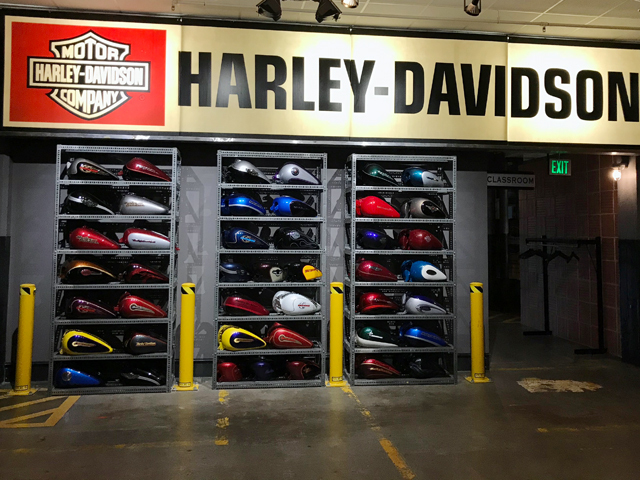 Even though not a single hog part is made there anymore, nor is a single screw or gasket installed on a bike on the site, the Harley-Davidson Juneau Avenue headquarters, 3700 W. Juneau Ave., remains a Mecca for motorcycle enthusiasts. 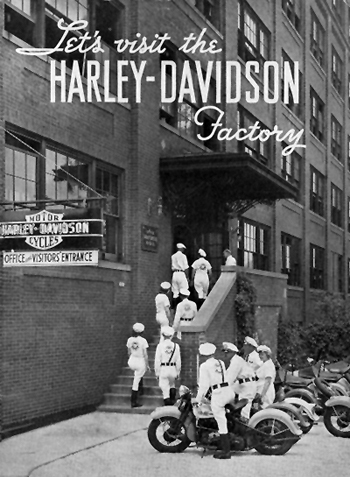 After all, it is where Harleys were born and where they were made, at least in part, up until the early 1980s. "It continues to be even after the museum was built," says Bill Jackson, manager of archives and heritage services at the Harley-Davidson Museum, which got its start as the archives department on the Juneau Avenue site. The original shed (top) and the shed after it doubled in size. "One thing that the museum will never have that this site has is that history. Motorcycles were built here from 1903-04 all the way up until 1973, during which time by my estimation over a million bikes were built here. "This is without question the birthplace of Harley." The sprawling site, where 950 Harley staffers still work – in administration, marketing and other departments – is also a perfect visual representation of the company's amazingly rapid ascent, from making a few bikes in a shed across Highland Avenue in 1903, to an impressive factory campus with numerous multi-story buildings that was cranking out more than 12,000 motorcycles just a decade later. Expansion of the 1906 building. 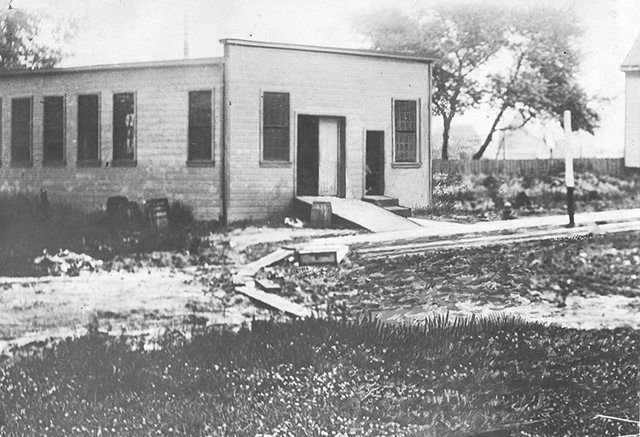 The legendary shed, built next to the Davidson family home – which stood where Miller Coors HQ is now located – allowed the company to move out of the basement of the house, and a year later it was doubled in size. 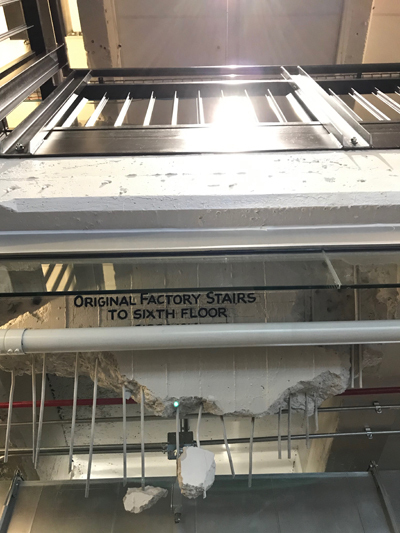 "People get a kick out of it when I tell them we doubled the size of our factory in one year," quips Jackson as we sit in a community workspace on the fifth floor of the 3700 W. Juneau Ave. building, which offers us a panoramic view of the site. The 1913 infill construction (above) and top floor addition at 3700 (below). 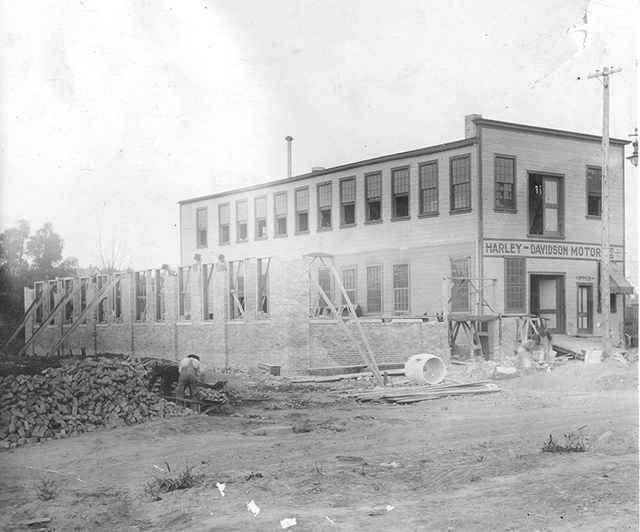 By 1906, a new brick building was built just under where we're now sitting and pretty soon that got a second-story addition and then an expansion to the west. Within another couple years, a six-story factory was added to the west of that, then another five-story one to the east. 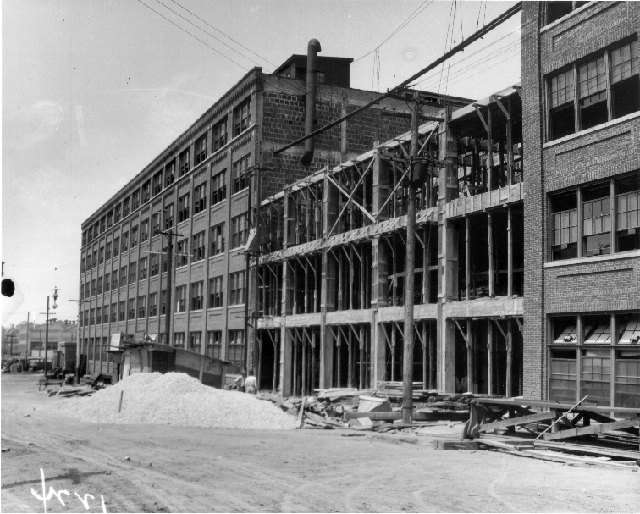 By 1910, the 1906 place was razed and the space between the two taller factories filled in with a six-story addition. Then the east wing got a sixth floor added, too. At least some of these early buildings were designed by no less than A.C. Eschweiler & Co. Others were the work of H. William Washburn. 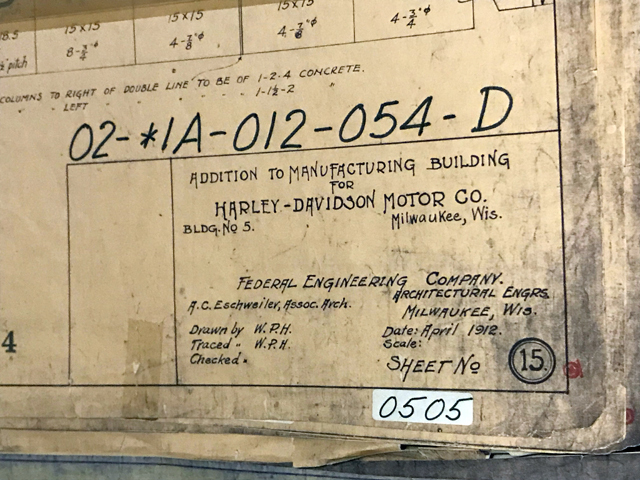 "One thing that's well documented in the Harley-Davidson dealer magazine is the aggressive build schedule, even by today's standards" says Jackson, "but by those standards it was just incredible. Just as you would do now, they built in incentives for the contractors to finish on time or early. Winter be damned! Build we must. Dynamiting frozen earth. "They kept buying property as early as 1907. A few years ago, a friend of ours from legal called and she said, 'I found a box of old documents, I think you might be interested in.' And it was the documents to buy a property and to get railroad easements and things like that (in) 1907, '08,' 09 as they were buying up pieces of this land. 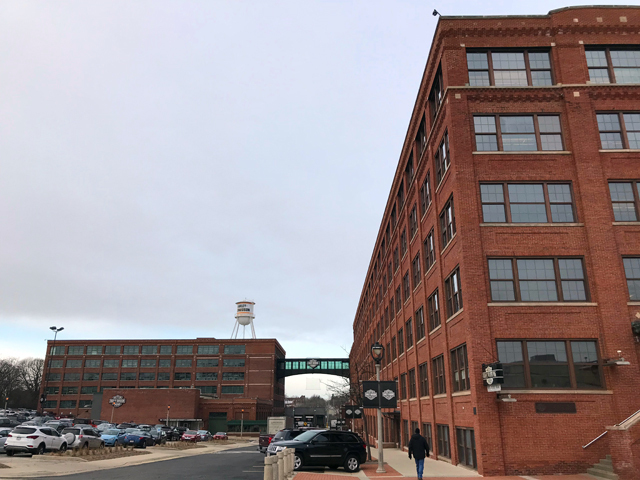 Because they already knew, I have no doubt as they were building this building, adding onto this building, they were already envisioning an (even) larger (factory)." 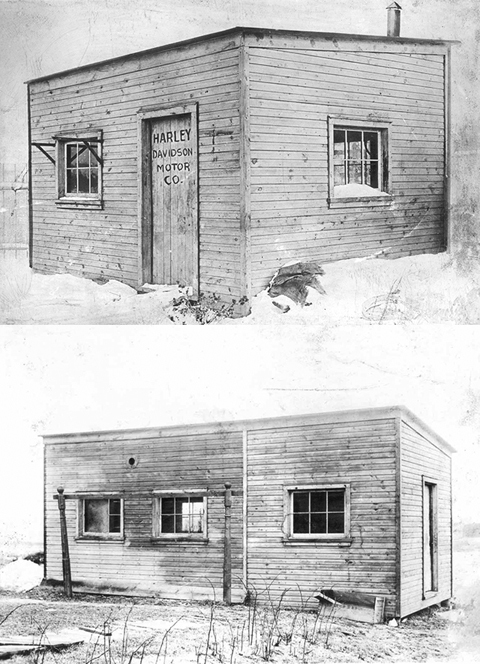 Harley was growing so quickly that factory construction couldn't be interrupted by petty nuisances like winter. 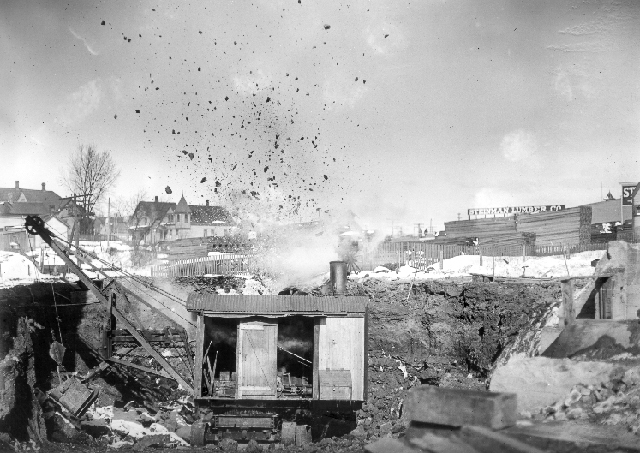 One archival photo shows workers dynamiting frozen ground in order to build. 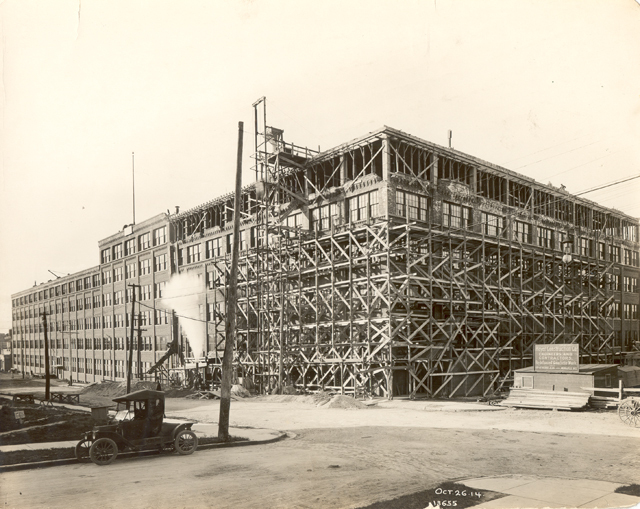 In fact, the construction dates of additions – 1910, 1912, 1913, 1918, 1919, 1920, 1921, 1923, 1926, 1957, 1966 (plus Harley rented factory space nearby and on Oregon Street in Walker's Point, as well as other locations around town) – is a testament to not only rapid construction but also to exploding Harley production numbers, at least until a postwar depression and then the Great Depression took their toll. "When this this building was completed in about 1913, you can see what happens to production numbers," says Jackson. Demand, it seems, was there, and Harley was accelerating as quickly as possible to meet it. 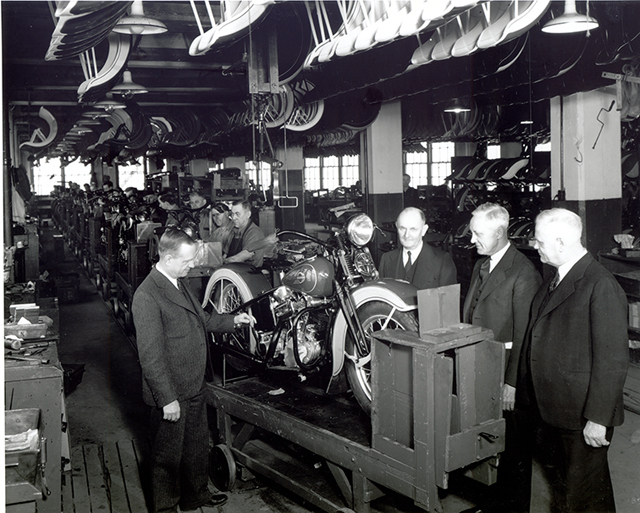 In 1948, Harley moved some production assembly to a Capitol Drive plant that had been a wartime propeller plant and is now a U-Haul location. The company's R&D facility is located just to the north of that site. Manufacturing and assembly work is now done at the company's Menomonee Falls plant, a plant in York, Pennsylvania – which opened in the early '70s during the time the company was owned by AMF – another that opened in Kansas City in 1998, and at a factory in Tomahawk, up in Lincoln County. "Motorcycle main assembly ended here in 1973, but some production did remain here I'm told until the early '80s," says Jackson. "By my calculation, on this site, about 1.1 million motorcycles passed through over the course of about 60 years." While there are public tours of the Menomonee Falls plant, no tours are offered at the Juneau Avenue site. But it does have a long history of showing visitors around, Jackson says. "We believe 2019 to be the 100th anniversary of factory tours. We know they were doing them before 1919, but that's the year they announced 'we're getting so many requests for factory tours, we're hiring a designated tour guide.'" In the early days, if you showed up for a tour, you'd have gotten the VIP treatment. "It would be the founders themselves," says Jackson. "For a period, Arthur Davidson, if he was around would personally give the person a free quart of Harley motor oil." Despite the lack of tours, a lot of folks who are not employees still come through the campus, which you can see from a distance, thanks to the rooftop water tower. 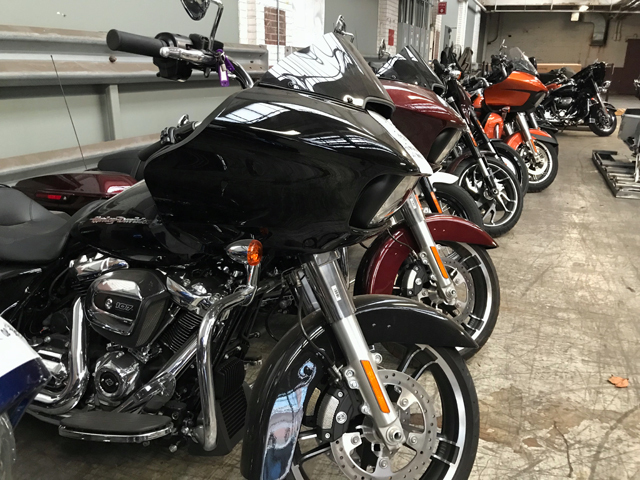 Mostly they come because Harley-Davidson University is here and in a series of labs and classrooms spread across two floors of one of the buildings, new dealers learn the ropes. Classes are taught in sales and in a variety of subjects aimed more specifically at mechanics. 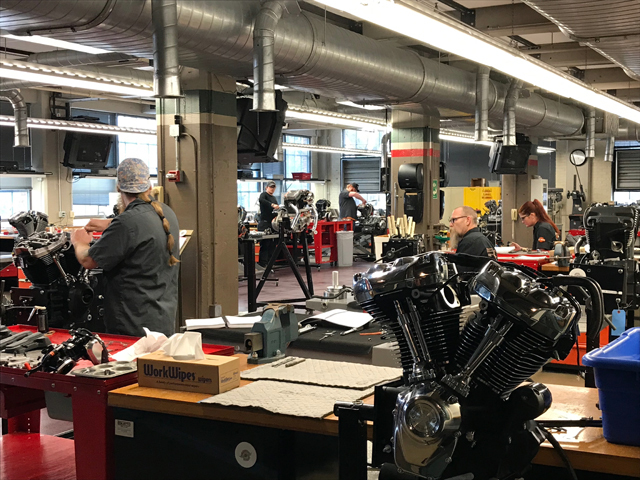 During my visit, we peeked into the engine lab and some others, where mechanics from Harley dealers around the country were learning to take apart and reassemble engines, balance wheels and do other tasks. The school celebrated its centennial in 2017. "In the old days Harley-Davidson University was called Service School," says Jackson. 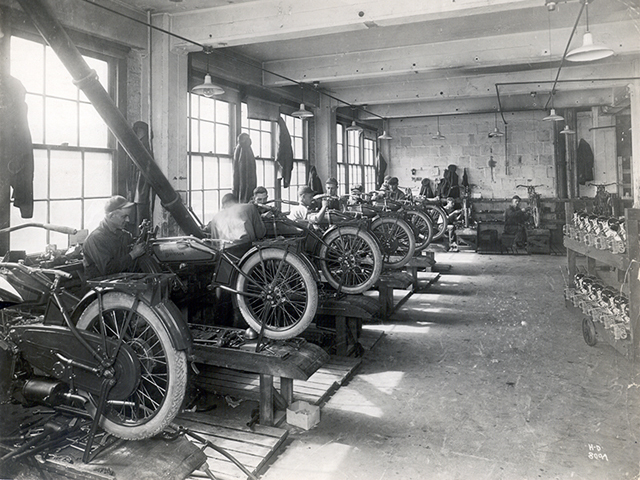 "It was born in World War I as a quartermasters' school, to train military mechanics." During big events, like Harley's 100th and 115th anniversary weekends, huge crowds turn up to see the buildings for themselves, to take pictures in front of the sign (a replica of an older one) that hangs outside the main entrance at 37th and Juneau and, on those special occasions, to shop in the on-site employee store, which sells Juneau Avenue branded merch that is much in demand among die-hard hog enthusiasts. Typically that store is not open to the public. "A lot of photos are taken here and for a while riders used to come and get married on the steps," says Jackson. "We had someone," adds Erin Barbeau, communications coordinator for Harley, "you see the water tower on the roof of (the) 3800 (building)? We had someone during the 115th anniversary get married up there. All their wedding pictures were right next to it. Pretty cool." Nowadays, former tool and die spaces and assembly areas and paint shops and other important production departments have been converted to, most typically, open-plan offices, though there are still some areas that have bike storage for various reasons. 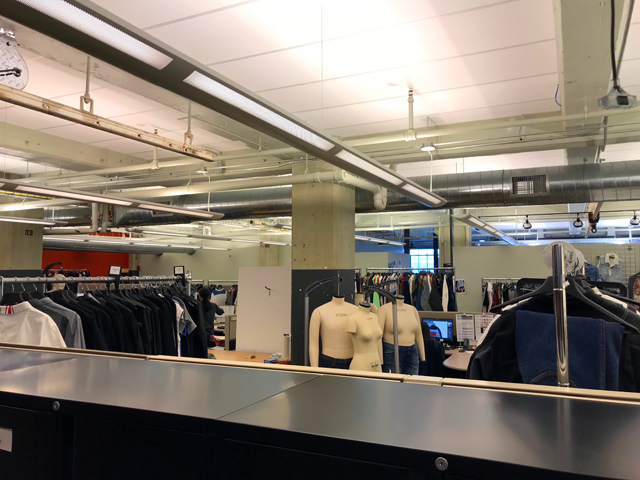 A customer service area occupies a one-story space with a sawtooth roof lined with skylights. 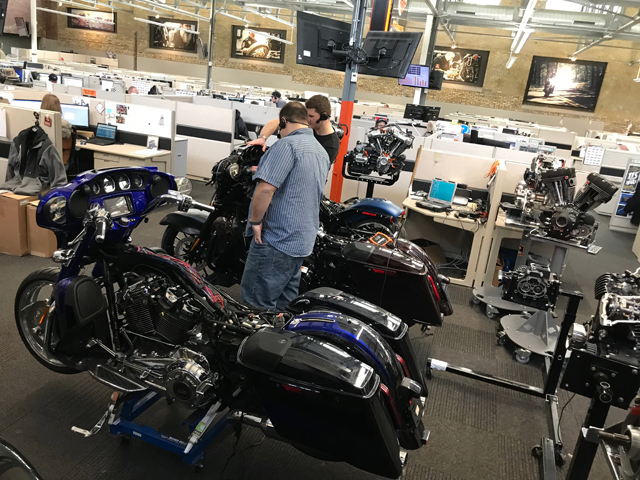 In here there are motorcycles and engines that the associates can consult when a dealer, customer or mechanic calls with a very specific question. In addition to the company store and H-D University, there's a cafeteria and an auditorium, too. There are also some big collaborative meeting lounges with seats and cafe tables. In one of them, a remnant of a former staircase dangles from the ceiling, with a sign explaining what it is. As you might expect, you'll see a lot of employees sporting Harley wear and also a higher-than-average appearance of long beards. Some areas still have old factory lines painted on the floors. 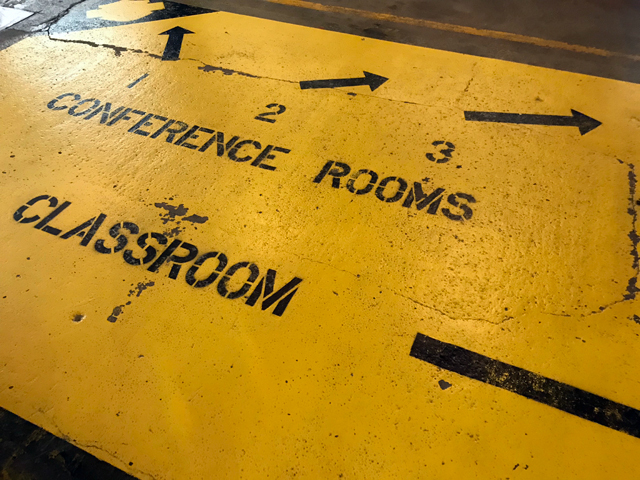 A few spots have modern wayfinding signs painted in a similar industrial style, serving as a reminder of the complex's manufacturing history. 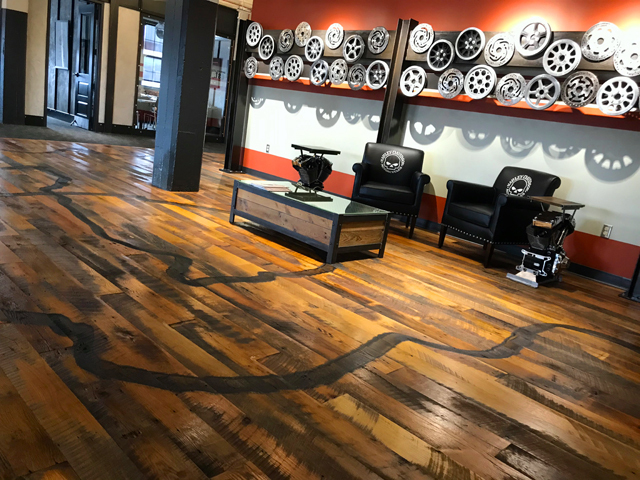 In the executive suite, the hardwood floor features a curvaceous loop that was created by an artist using tire burn from a revving bike. 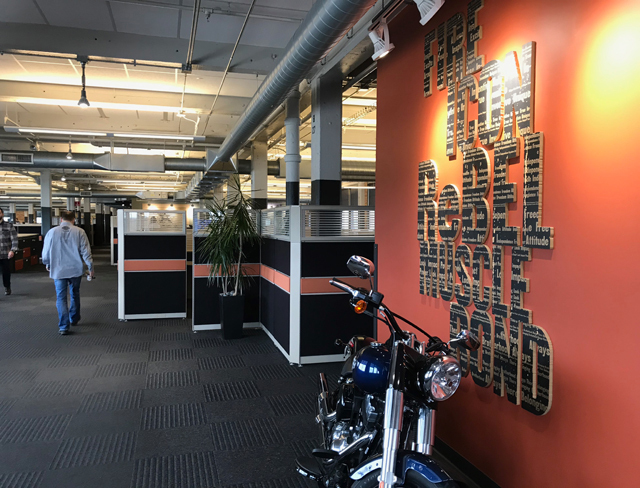 In the main lobby, there's a smiling attendant, a couple meeting rooms, complimentary coffee and, best of all, a real Harley, in a device that keeps it stationary, that you can crank up. While you practice shifting gears you can make that baby roar like a tiger. 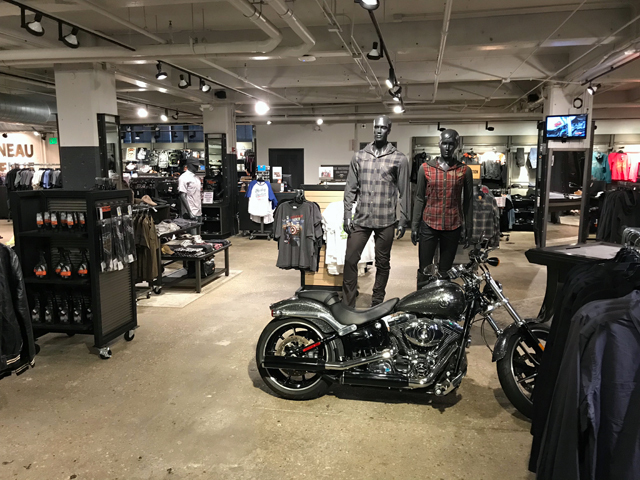 While you can't walk in and see the whole place for yourself most of the time, it's nice to know that Harley-Davidson thinks of Milwaukee as more than just a name it can put on its T-shirts (the department that designs those is also at Juneau Avenue! ), more than a place that represents the company's past. "Harley still lives in the neighborhood in which we were born," says Jackson. I'm sure there were opportunities for Harley to move out to the suburbs and build a completely new monument, big glass crystal palace ... monument to itself, and it didn't do that. "We've never left our roots, which I think is fantastic." 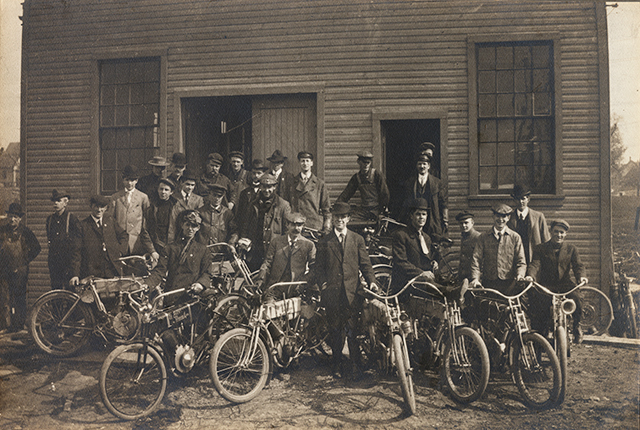 Archival photos courtesy of Harley-Davidson Motor Co.